Child custody is a hotly contested area in California family law courts. 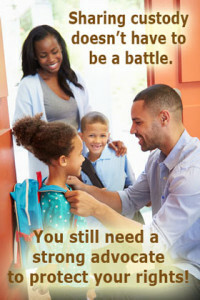 Parents who are unable to stay together as a family often fight over what is best for their kids. When you and the other parent are not able to make decisions together, a judge will have to make the decisions for you. Factors the judge will consider in making an order in the best interest of your child are: age and health of the child, the emotional ties between the child and each parent, the ability of each parent to care for the child, the child’s connections to school, home or community and whether there is a history of abuse, violence or substance abuse. Please schedule a free phone consultation to see how I can help you with your child custody legal problems. Child custody is a separate issue from child support. For instance, you cannot stop paying child support because the other parent won’t let you see your child. And you can’t cancel the other parent’s visitation if they do not pay child support that month. However, there is a relationship between the time each parent has with the child and the amount of child support the payor parent will be ordered to pay. Child custody has two main parts that will determine the rights the parent has to their child. 1. LEGAL CUSTODY determines which parent has the right to make decisions for your children’s health, education and welfare. It is common for the judge to order that both of you have legal custody. The parent(s) with legal custody make choices about their children’s childcare, school, religious activities, mental health therapy, doctor, orthodontist, health care in emergency situations, sports, summer camp, vacation, extracurricular activities, travel and probably most importantly, where the children will live. Legal child custody can be either joint or sole. a. JOINT legal custody is when both parents share the right and responsibility to make those important decisions. Joint legal custody works when both of you have very similar positions on how your children will be raised, where they will go to school, and where they will live. You don’t have to agree with every decision the other parent makes. Each of you can make a decision alone but you may end up in court over it. Cooperation and compromise are the keys to successful joint legal custody. b. SOLE legal custody is when one parent has the right and responsibility to make those important decisions of the child’s health, education and welfare. Sole legal custody tends to be ordered when the other parent has abuse issues (physical, alcohol or drug, or is not able to adequately manager their own life. 2. PHYSICAL CUSTODY determines where the child lives and who is responsible for the child’s daily needs. a. JOINT physical custody means the child can live with both parents almost equally and each parent is responsible for their child’s needs. Each parent will have timeshare with their child. In case one parent dies, the other parent has the right for the child to live with them without needing to seek a court order. b. SOLE physical custody means the child lives primarily with one parent and spends visitation time with the non-custodial parent. Sole physical custody can prevent problems between parents. The parent with sole physical custody is responsible for the child’s daily needs. Detailed Visitation: Parents who don’t get along, have difficulty communicating or compromising can benefit from a detailed visitation schedule. There is less chance for confusion, there is stability and the orders are easier to enforce. The downside is there is no flexibility. If the order is not followed, the other parent can call the police for assistance in enforcing the court order. Reasonable Visitation: A judge may order “reasonable visitation” when they are not provided with details of when the children will be with each parent. This only works when parents get along VERY WELL, are flexible and can compromise. If there are disagreements, then either of you can go to court to get a more detailed visitation schedule established. Supervised Visitation: When there are concerns about the child’s safety or the child and parent need time to become more familiar with each other before having time alone together, supervised visitation may be ordered. The court may order a professional agency provide the supervision and may involve additional cost for you to spend time with your child. No Visitation is the last resort for the judge who believes that even supervised visitation will be physically or emotionally harmful to the child. These orders are very rare. It is important for the stability of your children to develop parenting and timeshare plans that work for the children. I know it isn’t always possible to reach a reasonable agreement with the other parent. California family law courts allow judges to make decisions when the parents are not in agreement. No matter the outcome, you will do better with legal representation in child custody and visitation issues.